Milwaukee’s county roads originated in Indian trails that wound through the region. In the early nineteenth century, these routes became important channels for fur traders, settlers, and the U.S. military and mail service. A particularly important trail connected Fort Howard in Green Bay to Fort Dearborn in Chicago, cutting past the trading posts of Jacques Vieau and SOLOMON JUNEAU. In 1838, Congress allocated $15,000 to redevelop this Chicago-Milwaukee-Green Bay Trail into a more formalized “military road” between the two forts. It also authorized $10,000 for a road between Milwaukee and the new Wisconsin Territory capital, Madison. These roads remained quite rugged and flooded regularly. Travel was difficult and time-consuming on foot or horseback and nearly impossible for carts and wagons. Private interests improved area roads in the late 1840s and 1850s, developing “plank roads” connecting Milwaukee to other emerging regional centers. Crews carved new roadways paved with oak planks for smoother travel and lined with ditches to encourage drainage. Plank road developers operated these roads as turnpikes, collecting a toll of one to two cents per mile. RAILROADS made plank roads largely obsolete in the 1860s. Many of these corridors still remain, bearing the names of their original destinations, such as Watertown Plank, Mukwonago, and Green Bay Roads, and Lisbon, Appleton, and Fond du Lac Avenues. Over the mid-to-late nineteenth century, an expanding rectangular grid of “section-line roads” connected farmers to their markets and facilitated transportation between emerging hinterland communities. The Northwest Ordinance of 1787 established a regular system of land divisions in the territory. The resulting section lines formed the basic framework for modern county roads. Federal land surveyors reserved the boundaries of each section for public passage. Wisconsin law held county governments responsible for planning road systems along these boundaries. Local TOWNS constructed and maintained the roads with funding from local taxes. This rectangular grid set the stage for the convenient installation and maintenance of other infrastructure networks in the twentieth century, as well as better navigation and road safety. Most Milwaukee area county roads remained unpaved agricultural tracks into the early twentieth century. Often comprised of local farmers who volunteered to work off their road taxes, county road crews were typically unskilled in road construction. Many of their improvements were temporary. Increasing use of bicycles and motor vehicles, the growth of the dairy industry, and suburbanization placed a new premium on safe, smooth, and navigable county roads. County governments tapped new state and federal highway programs to upgrade county roads with more durable paving materials, traffic control and safety systems, and additional lanes. These programs also established the new Wisconsin State Trunk Highway System (1917), U.S. Highway System (1925), and County Trunk Highway System (1925). These systems incorporated several Milwaukee area county roads into new highway networks with standardized signage, numbered or lettered designations, and improved conditions. Some of these routes were also incorporated into the Milwaukee County Expressway System and the Federal Interstate Highway System in the mid-to-late twentieth century. County governments conduct much of the maintenance, emergency response, and law enforcement on these highway systems. ^ Louise Phelps Kellogg, “The Chicago-Milwaukee-Green Bay Trail,” Wisconsin Archeologist, New Series, 9, no. 2 (January 1930): 105. ^ John Gurda, The Making of Milwaukee (Milwaukee: Milwaukee County Historical Society, 1999), 46. ^ Gurda, The Making of Milwaukee, 79–80. ^ Gurda, The Making of Milwaukee, 80; Harold M. Mayer, “Travel by Water, Land, and Air: Transportation for Milwaukee County,” in Trading Post to Metropolis: Milwaukee County’s First 150 Years, ed. Ralph M. Aderman (Milwaukee: Milwaukee County Historical Society, 1987), 333; Carl Abbott, “The Plank Road Enthusiasm in the Antebellum Middle West,” The Indiana Magazine of History 67, no. 2 (June 1971): 95-116. ^ Gurda, The Making of Milwaukee, 80-81; Mayer, “Travel by Water, Land, and Air: Transportation for Milwaukee County,” 333; Carl Baehr, Milwaukee Streets: The Stories behind Their Names (Milwaukee: Cream City Press, 1995), xii, 10, 90-91, 105-106, 157. 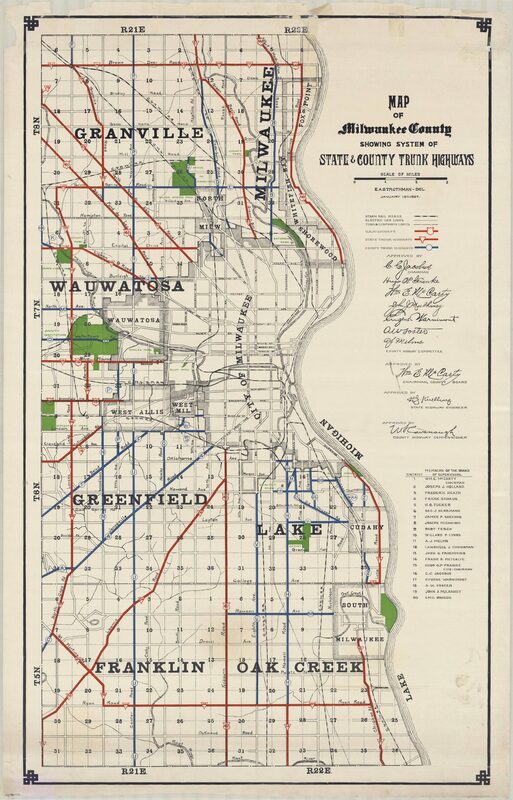 ^ Mayer, “Travel by Water, Land, and Air: Transportation for Milwaukee County,” 328-329. ^ Ballard Campbell, “The Good Roads Movement in Wisconsin, 1890-1911,” The Wisconsin Magazine of History 49, no. 4 (Summer 1966): 274; M. G. Davis, A History of Wisconsin Highway Development, 1835-1945 (Madison, WI: State Highway Commission of Wisconsin, 1947), 14. ^ Mayer, “Travel by Water, Land, and Air: Transportation for Milwaukee County,” 328. ^ Campbell, “The Good Roads Movement in Wisconsin, 1890-1911,” 274. ^ Campbell, “The Good Roads Movement in Wisconsin, 1890-1911,” 276-279. ^ Davis, A History of Wisconsin Highway Development, 1835-1945, 41-44, 58-59; George Bechtel, A History of Wisconsin Highway Development, 1945-1985 (Madison, WI: Wisconsin Department of Transportation, 1989), 58. ^ Gurda, The Making of Milwaukee, 331-334; Mayer, “Travel by Water, Land, and Air: Transportation for Milwaukee County,” 358-360. ^ Gurda, The Making of Milwaukee, 332; Mayer, “Travel by Water, Land, and Air: Transportation for Milwaukee County,” 361; Bechtel, A History of Wisconsin Highway Development, 1945-1985, 87-90. Campbell, Ballard. “The Good Roads Movement in Wisconsin, 1890-1911.” The Wisconsin Magazine of History 49, no. 4 (Summer 1966): 273-293. Kellogg, Louise Phelps. “The Chicago-Milwaukee-Green Bay Trail.” Wisconsin Archeologist, New Series, 9, no. 2 (January 1930): 103-106. Mayer, Harold M. “Travel by Water, Land, and Air: Transportation for Milwaukee County.” In Trading Post to Metropolis: Milwaukee County’s First 150 Years, edited by Ralph M. Aderman, 324-386. Milwaukee: Milwaukee County Historical Society, 1987.